Quality Cutting Material The Kyo Japanese Forged Stainless Steel Chef's Knife comes equipped with three-layered structure that is resistant to rust, and is Carefully formed using the artisanal techniques of the famed blacksmiths of Seki to attain a lasting and vivid sharpness. Very Convenient Handle - The Kyo Japanese Forged Stainless Steel Chef's Knife comes with 8.3-in / 21-cm While Stainless Steel hollow handle makes the knife light, assuring that your hand will not get tired even if cutting for long periods. This is made to symbolize and represent the essential beauty as well as functionality of knives. This work of art has all the splendor and good looks of classical knives from Japan. The rounded shape handle is of unique style which fits extremely comfortably and snugly in hand. Fine Quality Blade - Kyo blade is a blade that uses the artisanal methods of the ever popular blacksmiths of Seki so as to attain a remarkably vivid sharpness. Ideal for meat and vegetable. Suitable for chef and professional orientation. Quality Cutting Material - The Kyo Japanese Forged Stainless Steel Chef's Knife comes equipped with three-layered structure that is resistant to rust, and is Carefully formed using the artisanal techniques of the famed blacksmiths of Seki to attain a lasting and vivid sharpness. 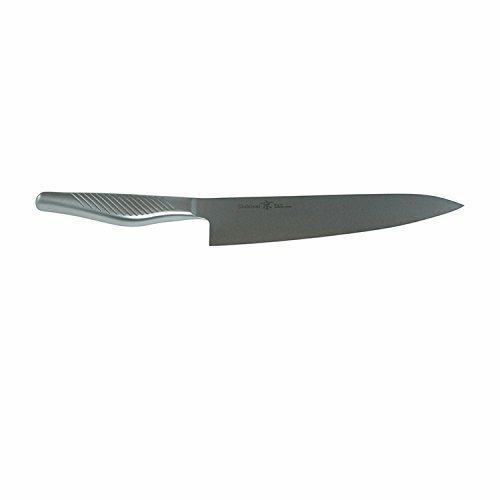 Very Convenient Handle - The Kyo Japanese Forged Stainless Steel Chef's Knife comes with 8.3-in / 21-cm. While Stainless Steel hollow handle makes the knife light, assuring that your hand will not get tired even if cutting for long periods. This is made to symbolize and represent the essential beauty as well as functionality of knives. This work of art has all the splendor and good looks of classical knives from Japan. The rounded shape handle is of unique style which fits extremely comfortably and snugly in hand. Fantastic Finish - The amazing matte finish is applied once more after mirror polishing to provide a gently textured finish that matches the overall form of the knife. It is makes it very appealing. Fine Quality Blade - Kyo blade is a blade that uses the artisan methods of the ever popular blacksmiths of Seki so as to attain a remarkably vivid sharpness. Ideal for meat and vegetable. Suitable for chef and professional orientation. If you have any questions about this product by Shikisai, contact us by completing and submitting the form below. If you are looking for a specif part number, please include it with your message.